I have always been a competitive person. As a kid I was always involved in multiple sports and various competitive activities. I played baseball all through high school, but after a few years of inactivity in college, I was very out of shape. I finally got tired of feeling that way and around the same time, my boss mentioned a new Crossfit gym had opened up in Burleson. I immediately decided to go check it out. On my first day at Crossfit Burleson it was only their second week of being open and after that first workout I was hooked. That was in 2012 and I have been at Crossfit Burleson ever since. CrossFit has changed my life significantly over the last five years. I am the fittest and healthiest I have ever been, I have made friends that feel like family and I met my now wife Brandi, at CFB in 2013. I am constantly improving and only getting stronger over time, getting a little better each day. 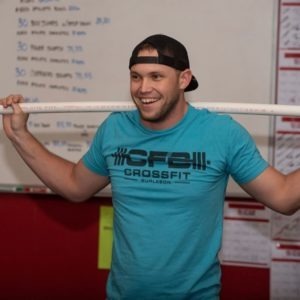 Now I look forward to sharing my continued growth as a coach and athlete and my passion for health and fitness with everyone at Crossfit Burleson.